We bought the chest of drawer, the bed and the night stand on the same transaction. I'm very pleased with our purchase, as the products are solidly built, and seem they will last long. It doesn't come assembled, but the set includes very detailed instructions, and is not that hard to put together. Overall, I highly recommend this product. 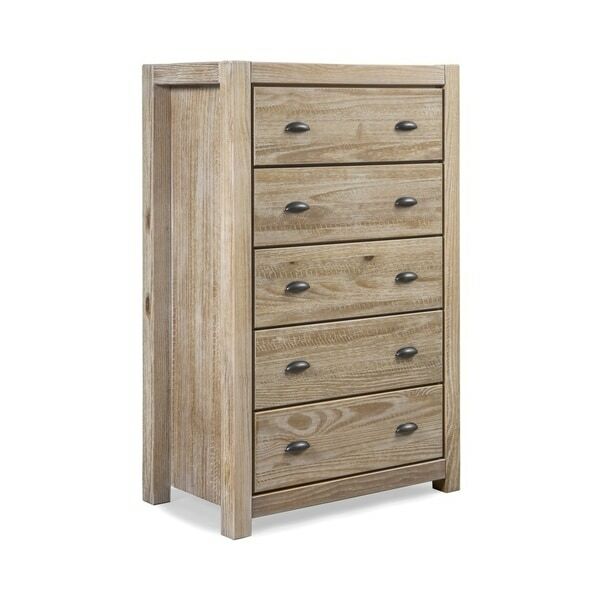 Give your bedroom a Rustic look with the warmth of this Solid Wood Chest. This design has five spacious 5” deep drawers. Made of 100% Solid Pine wood from Southern Brazil, this chest features a sturdy and robust construction that can last for years. Featuring an eco-friendly design, this dresser has minimal impact on the environment as all wood comes from renewable forests. Its Distressed and Rustic finish is very durable and easy to touch-up. Dimensions 32.5 In. X 18.0 In. X 53.5 In. Love love love my new chest!! Last year I purchased the bed. This year I added both the dresser and chest of drawers. They are lovely, well made and reasonably heavy. With the dresser I added an old antique mirror I had already and it was a perfect combo for my distressed farmhouse theme. The color is amazing...light and naturally distressed. I lined the drawers and they are plenty deep enough for all my clothes. Great investment! Wish they made more pieces with the wood color blend. Love this dresser. We ended up buying the entire bedroom set. The color is lighter than in photos with lots of detailing grain. Unfortunately,Drawers are not very wide or deep. Assembly is time consuming but not difficult Would definitely recommend but keep in mind , not a very large piece. The wood has a great color and nice distressing. The drawers are very deep and solid. highly recommend if you are considering this chest. just the right height as well. This dresser is an excellent quality piece at a fraction of the cost elsewhere. It is a solid wood product that had spacious drawers. I find it cool to own a product from Brazil. I couldn't be happier with this chest! It is the perfect size and it's one sturdy piece! This is a great investment and a piece that will last a long time. I got it in the rustic off-white finish and it's beautiful. It's off-white with more brown distress lines on it. The hardware is rubbed bronze but looks very close to black until you look closely. I love it. Putting it together was easy, took me a little over an hour, you will need a second person for part of it. But over all, very easy. This style will look great in so many different decor styles from farmhouse, boho, coastal and rustic modern. Very nice product. Easily assembled but there are a LOT of pieces. Make sure you have a power screwdriver. It will save an enormous amount of time. 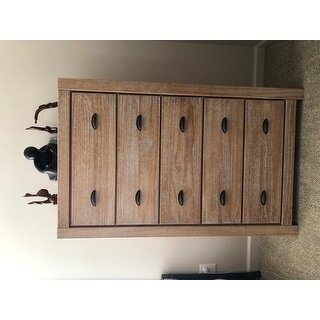 I bought this piece, the night stand and the dresser. Even though I ordered these separately and days apart they all delivered on the same day. The only problem I had was I misread one of the "B" boxes and swapped out the Dresser B box for the Chest B box. Beware if you do this as all of the similar parts have the same assigned numbers. There were two pieces which I thought weren't correct but it was only because I was into the wrong box. Once I figured out the problem it was a breeze to finish. I put together all 11 draws total from each piece at the same time like a production line. I would definitely buy these again ! Solid wood! Love it. Bought the white. We ordered this entire set. It is very sturdy. The gray color is very gray with defined white grain lines. It comes in two boxes and takes a very long time to assemble. Fortunately my husband said the directions are fantastic. I would recommend paying extra and getting the assembled versions. Had we known assembly would take so long we would have ordered a different color as some of the colors come assembled. It is a nice set. I gave it four stars because of the tedious assembly. 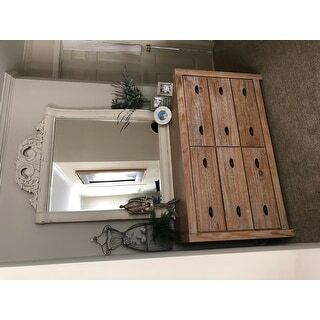 Absolutely in love with this dresser. I have a very small closet so I got this to add some space and am so glad I did. Beautiful color, excellent quality wood, and very sturdy. Like this item very nice. my daughter was excited to receive this item. I would definitely purchase this item again. The price was very reasonable for the quality of the item. Last year I purchased the bed and absolutely love it! This year purchasing both the matching dresser and chest. Really looking forward to completing the set!